Welcome to the Paper Pumpkin Pop Up Blog Hop! We are all fans of this monthly crafting kit and want to share our enthusiasm for this box of fun and creativity with you! The beauty of the Paper Pumpkin kit is that you can follow the directions provided in the kit to make the projects as they were designed, or use the supplies as a starting point and let your creativity run wild. 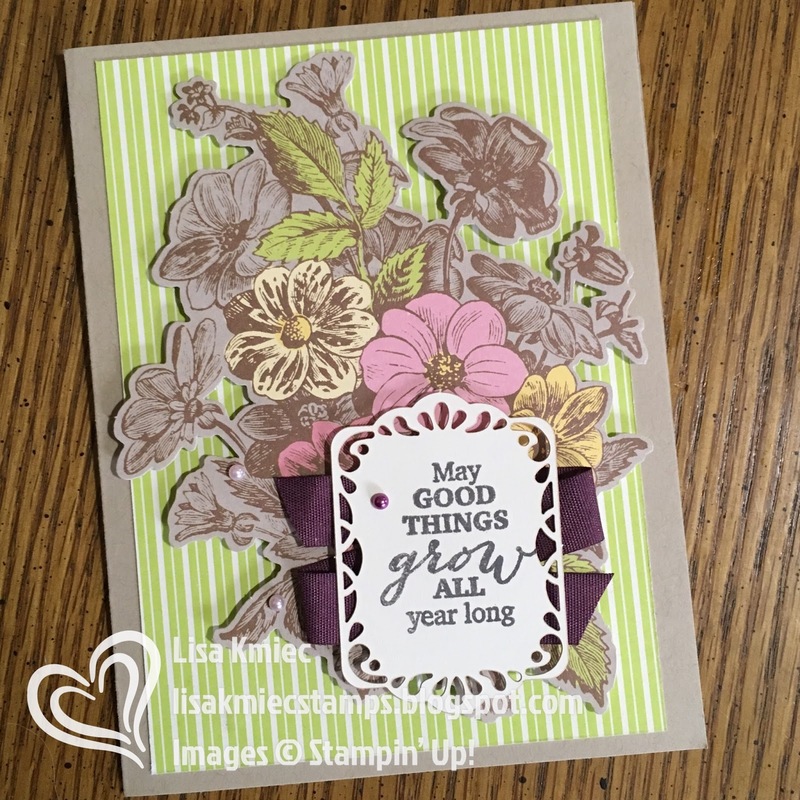 On this hop we will be sharing lots of ideas with you on how to use this March Paper Pumpkin kit: May Good Things Grow. This month's Paper Pumpkin kit features a vintage style floral and seed packet design. 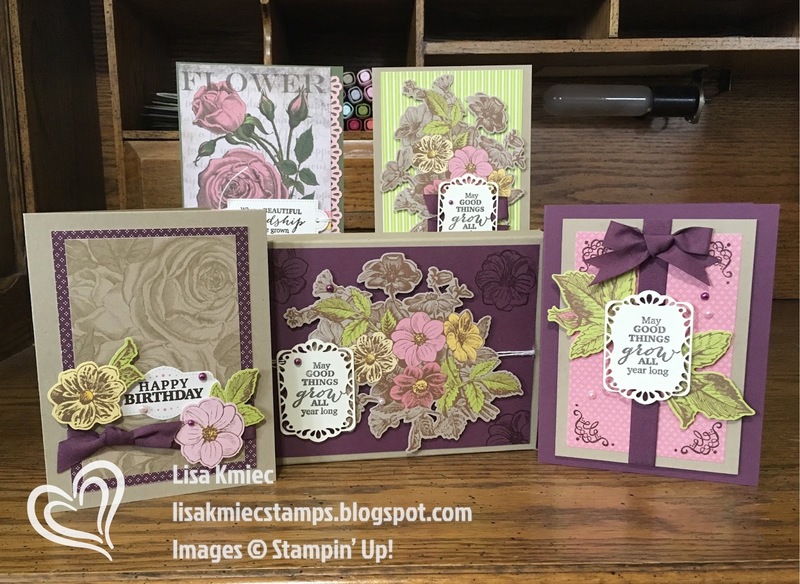 I am absolutely in love with all things vintage, so this month's kit is right up my alley! In addition to the great design, this kit is also packed full of all kinds of embellishments (ribbon, bakers twine, pearls, and brads). The possibilities are endless with this one! For my first card, I cut apart one of the seed packet envelopes. The envelopes are cute as they are, but I really felt they needed to be made into cards. This first card I used the front of one of the envelopes. I trimmed it down to size, added the sticker tape and sentiment tag attached with bakers's twine. 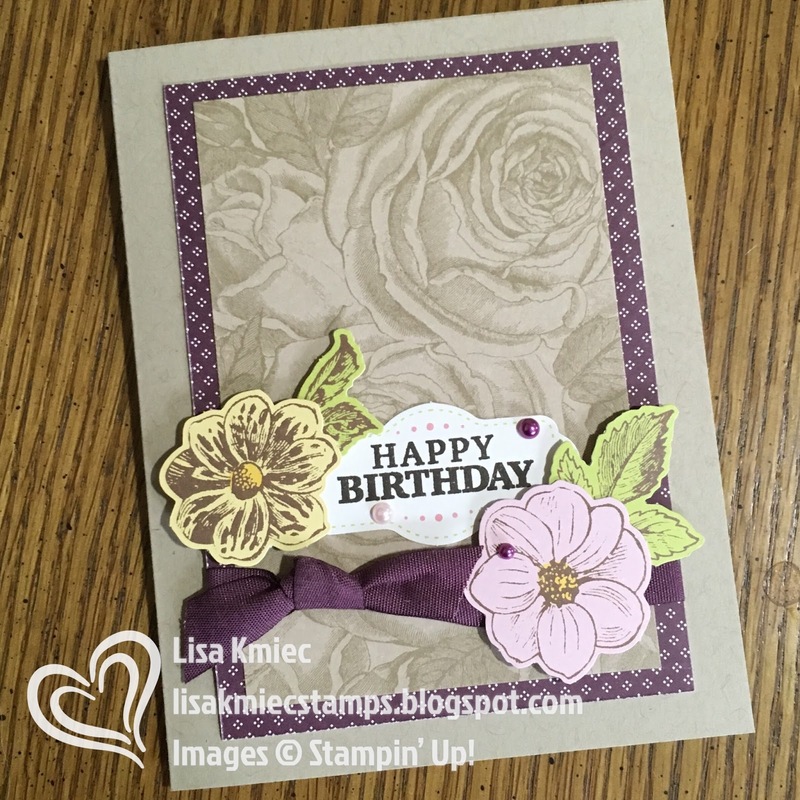 I added a strip of cardstock punched with the Decorative Ribbon Border Punch and added to an Always Artichoke card base. 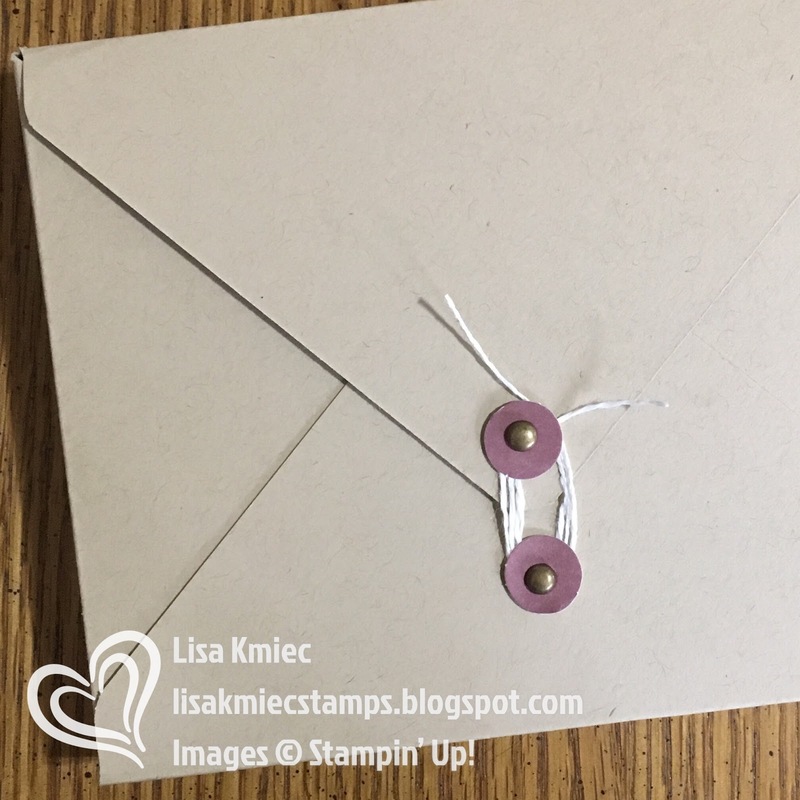 This card uses one of the printed panels from the kit, mounted on a piece cut from the inside of an envelope. I wrapped that in ribbon tied in a knot and added the sentiment and elements from the kit. This card also used the inside of one of the envelopes. I added the large floral element from the kit, a zig zagged piece of ribbon, the sentiment and a few pearls. Easy peasy! The last card also features elements from the kit, mounted on a Fresh Fig card base. 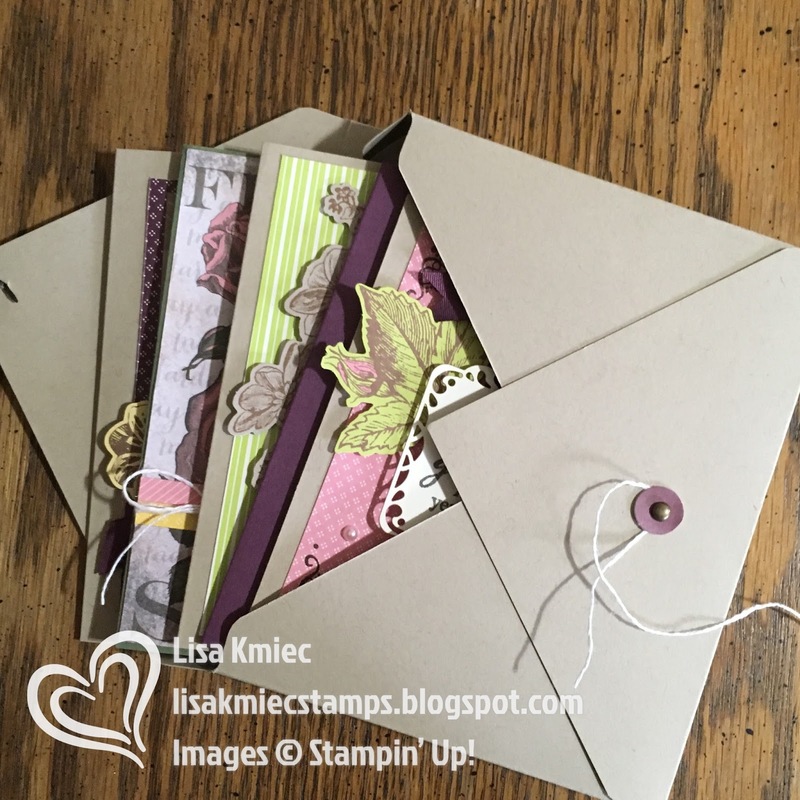 I stamped the corners of the printed piece, attached it two a crumb cake panel and wrapped with ribbon. 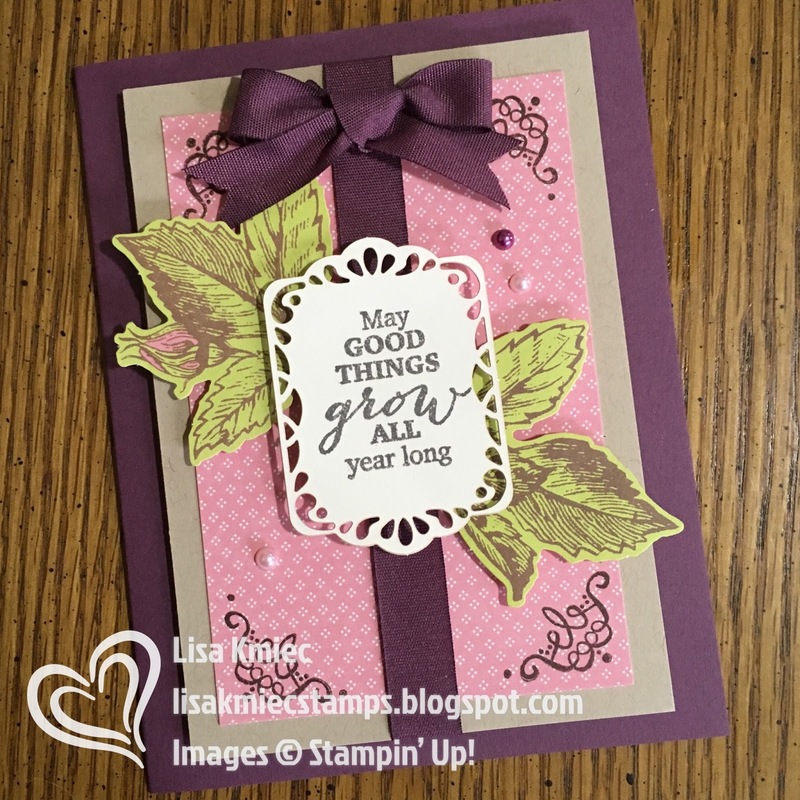 I added a bow, leaf elements, pearls and a sentiment from the kit. The card box is a 6" x 4-1/2" x 1" box made with the Envelope Punch Board. 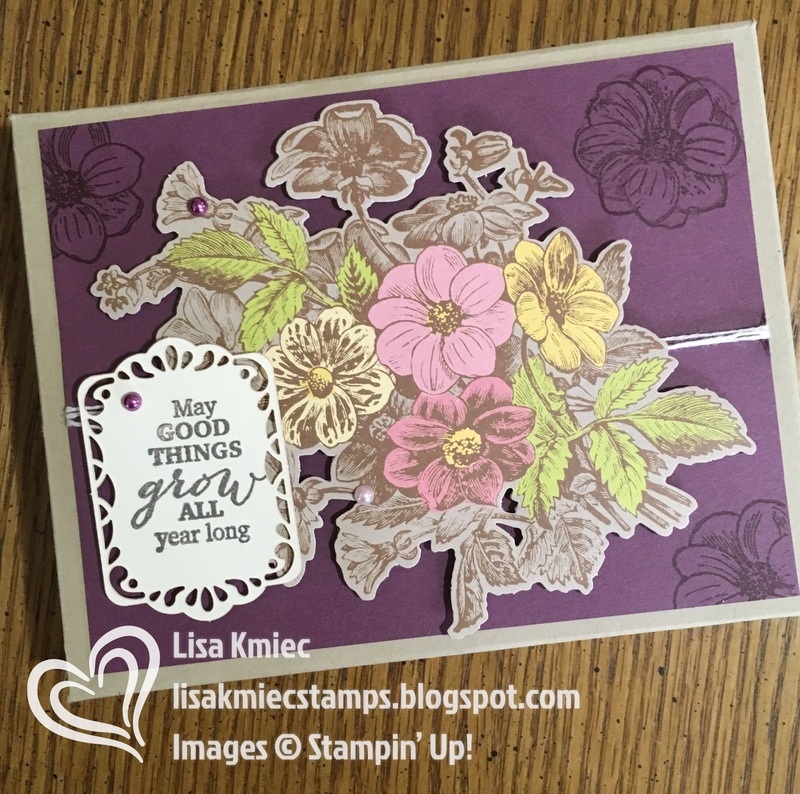 Added a panel of Fresh Fit to the front, stamped with the flower from this month's stamp set. 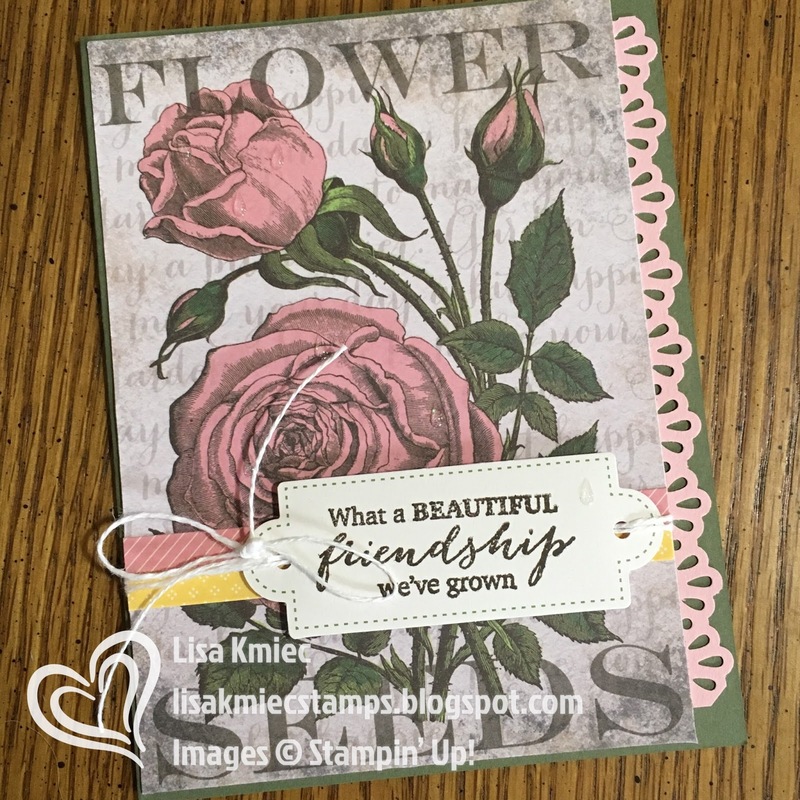 I used the large floral elements and added a sentiment label with pearls. For the back of the box, I used the same closure treatment as the seed packet envelopes designed for the kit. The circles are attached with brads and then wrapped with baker's twine. The box is sized perfectly to hold all four cards and envelopes. 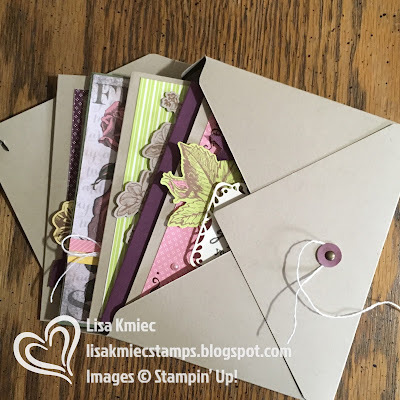 I hope you enjoyed what I had to share with you today and have been inspired to use your Paper Pumpkin kit! 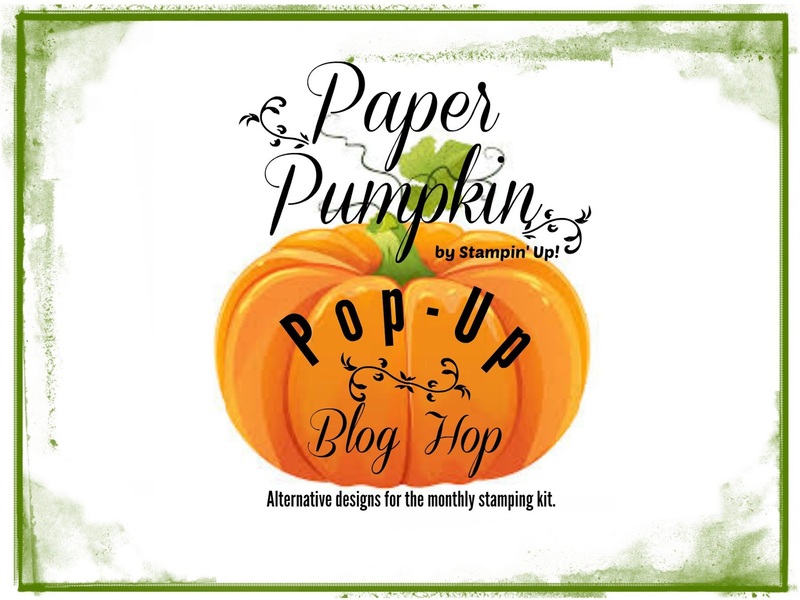 If you are not currently a Paper Pumpkin subscriber, now is the best time to join in the fun. New subscribers will receive 50% off their first 2 months when they subscribe by May 10th, using the promo code SAVEFIFTY0418. Contact your demonstrator to get started or CLICK HERE to subscribe. 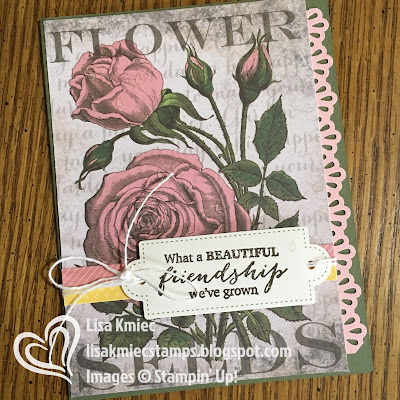 Thank you for joining us as we share with you the possibilities of Paper Pumpkin, now hop over to Sharon's blog to see what she has created with this month's Paper Pumpkin kit!